I have a dual-boot MacBook Pro late 2013 with macOS Sierra and Windows 10 (BOOTCAMP) already installed. I want to install Ubuntu as a third OS. Is there any (easy) way to do it? Note: These instruction have been updated for use with Ubuntu 18. This answer installs Ubuntu on your computer without the use of third parity tools for either the installation of booting of Ubuntu. The Ubuntu file I downloaded was named ubuntu-16.10-desktop-amd64.iso. I assume you have created a bootable Ubuntu USB flash drive installer and have verified the contents. I also assume you have verified hardware compatibility by successfully booting the live version of Ubuntu. These instructions have been divided into the three main sections listed below. Create Space on the Drive for Ubuntu : This is accomplished by using the MacOS Terminal application to enter commands. Install Ubuntu : This uses the Ubuntu flash drive installer. Add Ubuntu to Startup Manager - Here you basically use the MacOS to move the necessary files to the proper locations. 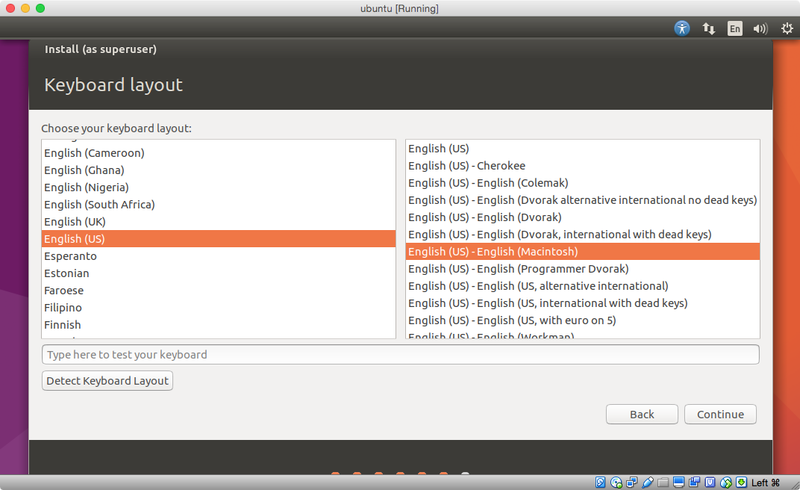 This will allow Ubuntu to be selected from the Startup Manager. 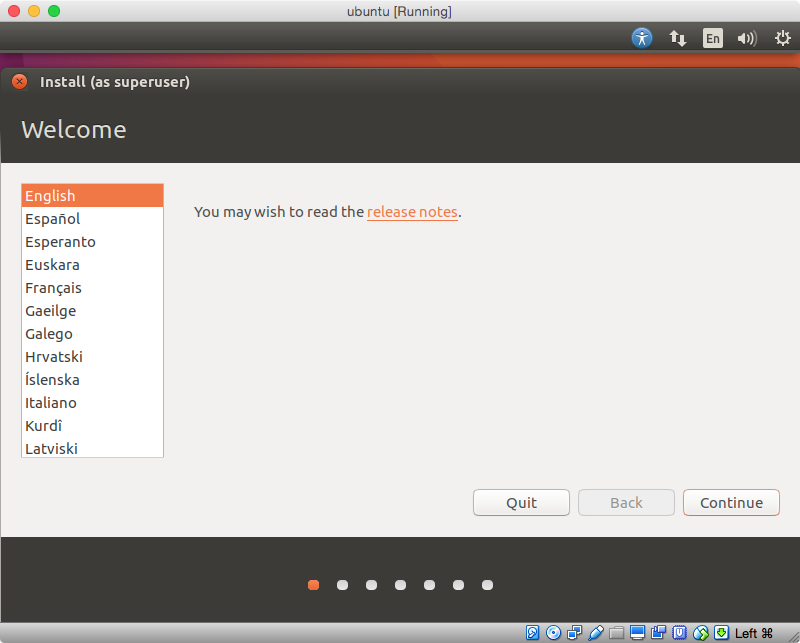 You will not need rEFInd to boot Ubuntu. Note: If another user has a different partition scheme than shown in this example, the post a comment to me and I will try to update my answer. For the purpose of illustrating the steps needed, I created a drive slightly larger than your actual drive. The output from diskutil list disk0 is given below. The output from sudo gpt -r show /dev/disk0 is given below. The output from sudo fdisk /dev/disk0 is given below. Note: After repartitioning the drive, you should verify that the values shown below have not changed. Certain changes will cause Windows to view the drive as hybrid partitioned. If this occurs, Windows may fail to boot or malfunction. I decided to allow total of about 40 GB for Ubuntu. If you need a different size, then make the appropriate adjustments. 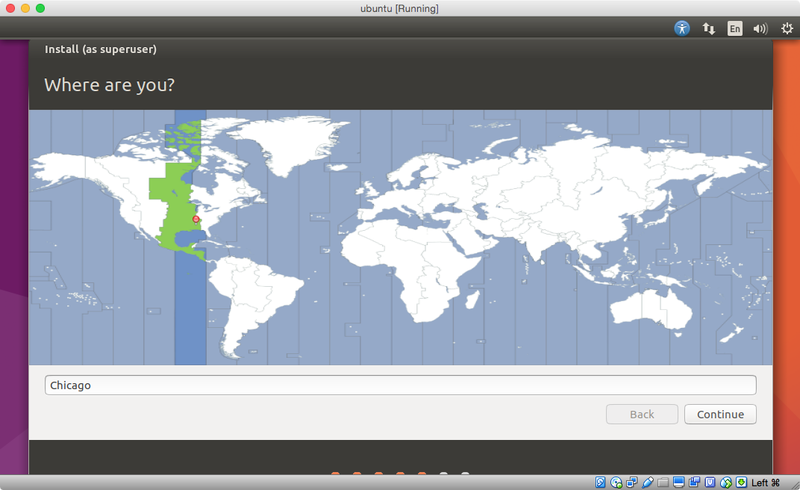 I will be creating 3 new partitions for Ubuntu. A description for each is given below. 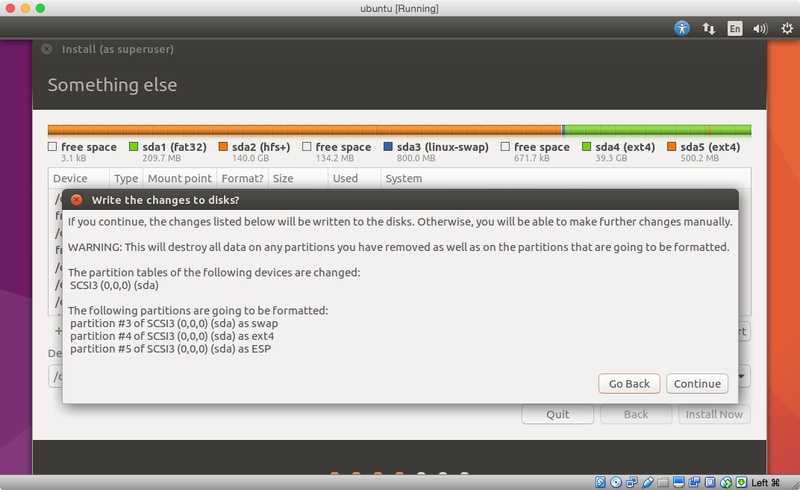 A Swap partition. 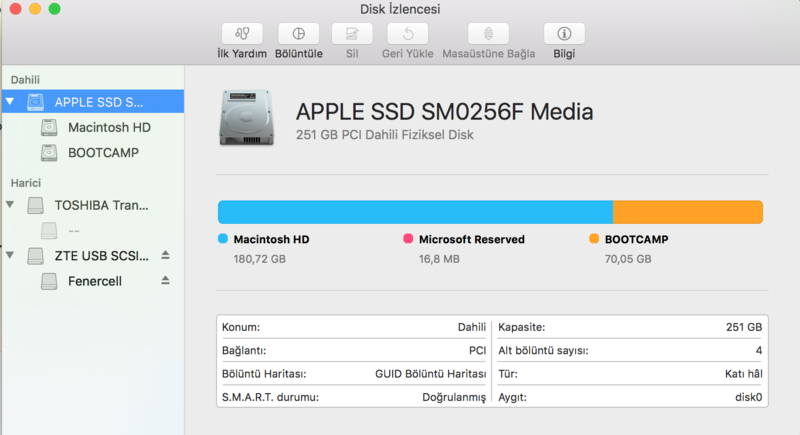 The size of this partition should be between 1 to 2 times the size of the memory installed in your Mac computer. I will be using a size of 800 MB. Obviously, the size you will be using will be much larger. A Ext4 Journaling file system partition to hold Ubuntu. 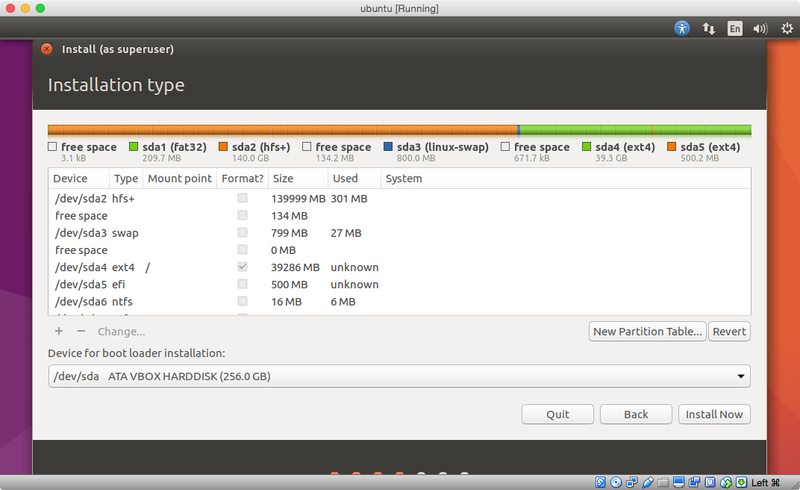 This partition will consume most the approximately 40 GB of space I allocated for Ubuntu. An EFI System partition. This is required for Ubuntu to appear on the Mac Startup Manager. This manager appears when you turn on or restart your Mac and hold down the option key. The Startup Manager can be used to change the default startup disk (i.e. operating system) or can be used to temporarily boot from a startup disk. I have chosen size of 500 MB for this partition. I have chosen to allow the Ubuntu installer to actually create the 3 new partitions. So at this point, I only need to shrink the MacOS partition by approximately 40 GB and create 3 new placeholder partitions. The placeholders will be replaced later by the Ubuntu installer with the actual partitions described above. The command to change to partitioning is given below. Since the MacOS partition is about 180 GB, I used a desired value of 140 GB (140G). Also, I used a value of 800 MB (800M) for the size of the new Swap partition. Since you will desire a larger size, then you will need to make the appropriate substitution. Note: The two values of 200 MB (200M) were chosen arbitrarily, these values will change later. The output from this command is shown below. Note: The last 200M was ignored by the diskutil command. Instead, most of the remaining free space was allocated to the disk0s5 slice. The output from the command sudo fdisk /dev/disk0 is unchanged from what was given above. Insert the Ubuntu flash drive and restart the Mac. Hold down the option key to invoke the Startup Manager. Select to EFI boot from the USB flash drive. When prompted, choose the option shown below. Note: For a better view, either click on the image or open the image in a new window. I choose to select both options below. Choose the option shown below. Select the partition shown below. This partition should be the same size as previously specified for the Swap partition when the diskutil resize volume command was entered. Click on "Change..." and select "swap area" in the popup window as shown below. Do not change the partition size. Next, click on "OK". Select the partition shown below. Next, click on the "-" to delete this partition. Select the free space as shown below. Click on the "+" to open a "Create partition" popup window. Select "EFI System Partition". Also, change the size to 500 MB and click on the "End of this space" button. Next, click on "OK". Click on the "+" to open a "Create partition" popup window. Select "Ext4 journaling file system". Also, select "/" as the "Mount point". Do not change the partition size. Next, click on "OK". Click on the "Install Now" button shown below. Click on the "Continue" button shown below. 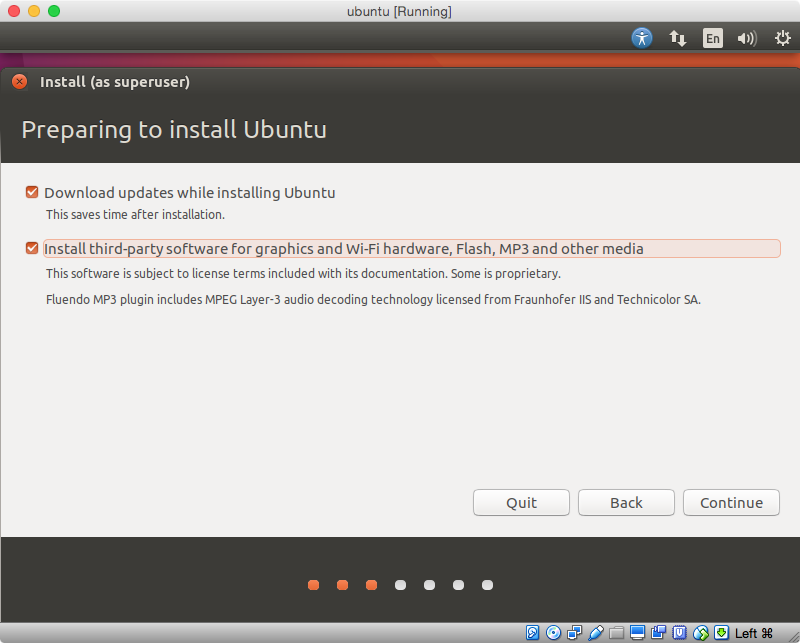 Continue and install Ubuntu Linux. When finished, restart and hold down the option key to invoke the Startup Manager. Select to boot from the MacOS volume. 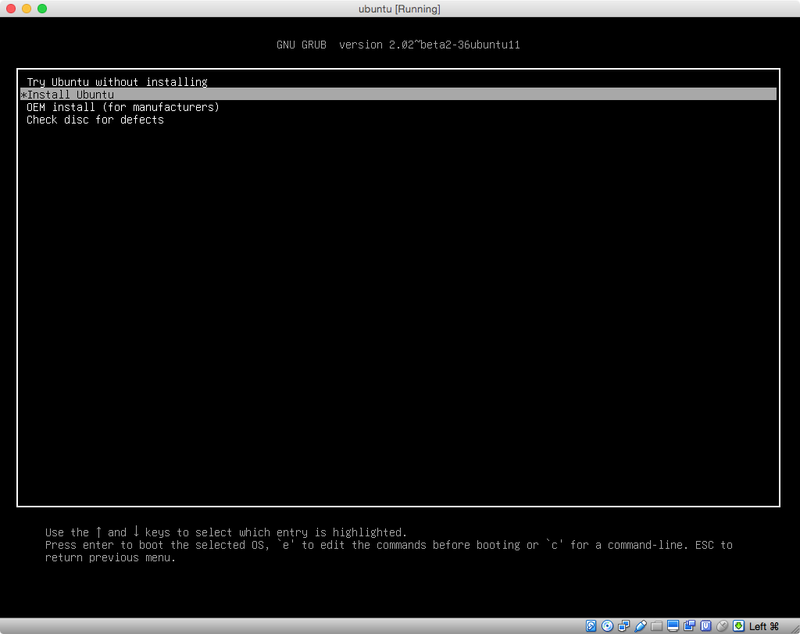 After installing Ubuntu, the command diskutil list disk0 produced the following output. The command sudo gpt -r show /dev/disk0 produced the following output. 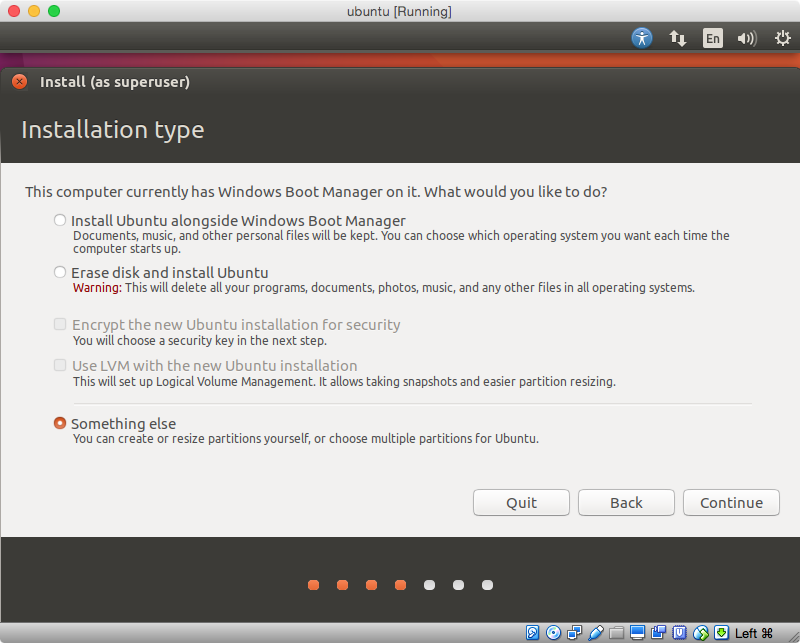 Note: The 3 placeholder partitions have be replaced by the partitions specified while installing Ubuntu. To make Ubuntu appear in the Startup Manager, execute the following steps. Mount the EFI System partitions by entering the commands given below. Use the Finder application to copy the EFI folder from volume EFI to the volume NO NAME. If you are not installing Ubuntu 18 or newer, then you can skip steps 4, 5 and 6. Move all the folders and files in the EFI/Boot folder on the EFI volume to the Trash. Copy the file bootmgfw.efi on the EFI volume from the folder /EFI/Microsoft/Boot to the folder /EFI/Boot. Rename the file bootmgfw.efi in the /EFI/Boot folder on the EFI volume to the name bootx64.efi. Remove the folders and files that were added to the EFI volume during the Ubuntu installation. To accomplish this, move the folder EFI/Ubuntu on the EFI volume to the Trash. Remove the Microsoft related files from the NO NAME volume. To accomplish this, move the folder EFI/Microsoft on the NO NAME volume to the Trash. If you are installing Ubuntu 18 or newer, then you can skip steps 10, 11 and 12. Move the file EFI/Boot/bootx64.efi on the NO NAME volume to the Trash. Copy the file grubx64.efi on the NO NAME volume from the folder /EFI/ubuntu to the folder /EFI/Boot. Rename the file grubx64.efi in the /EFI/Boot folder on the NO NAME volume to the name bootx64.efi. (Optional) Download a collection of icons from the sourceforge web site Mac icns. Use the Finder application to open the downloaded file mac-ices.dmg, then enter the command below to copy the Ubuntu icon file os_ubuntu.icns to the NO NAME volume. Use the Finder application or enter the commands below to unmount the EFI System partitions labeled EFI and NO NAME. Install Ubuntu. Insert the Ubuntu flash drive and restart the Mac. Hold down the option key to invoke the Startup Manager. Select to boot from the USB flash drive. Not the answer you're looking for? Browse other questions tagged mac bootcamp unix dual-boot .